Miles hiked in 2013: 638.3 with 166,035′ gain. #077 on 12-29-13. Icehouse Canyon to Icehouse Saddle and down Chapman Trail solo hike. Stats: 8.9 miles, 2620′ gain. View just below Icehouse Saddle. #076 on 12-15-13. 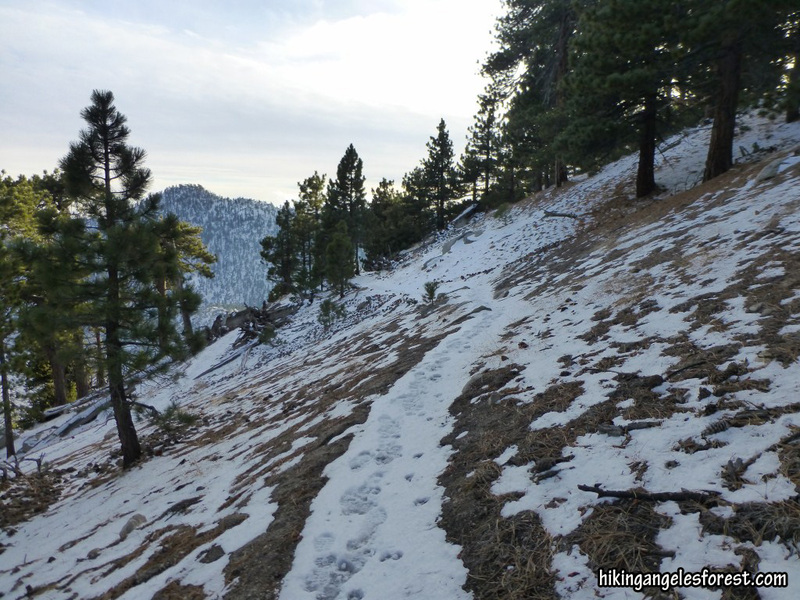 Baldy Bowl Trail to Inconspicuous CG solo hike in snow. Stats: 6 miles, 2640′ gain. View from Inconspicuous Trail Camp. #075 on 12-8-13. Mt. 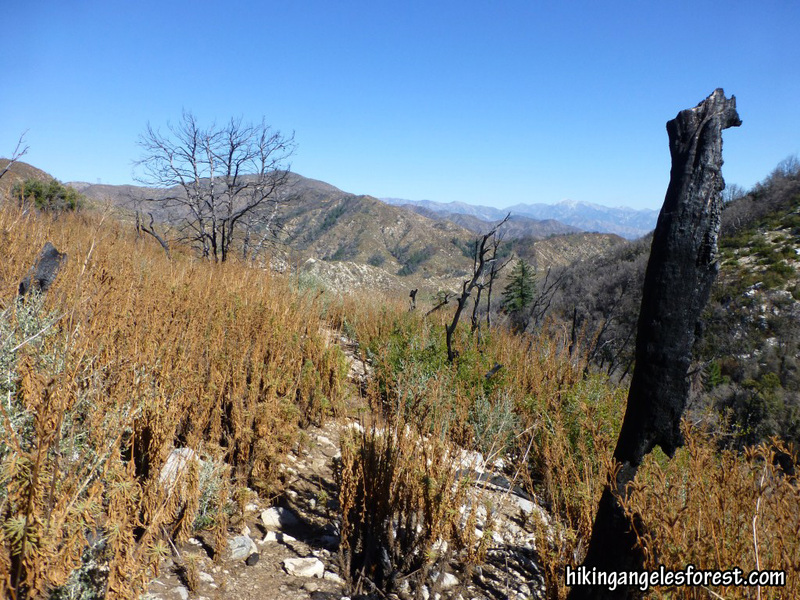 Waterman Trail from Angeles Crest to summit and back solo hike in snow. Stats: 6 miles, 1250′ gain. #074 on 11-28-13. 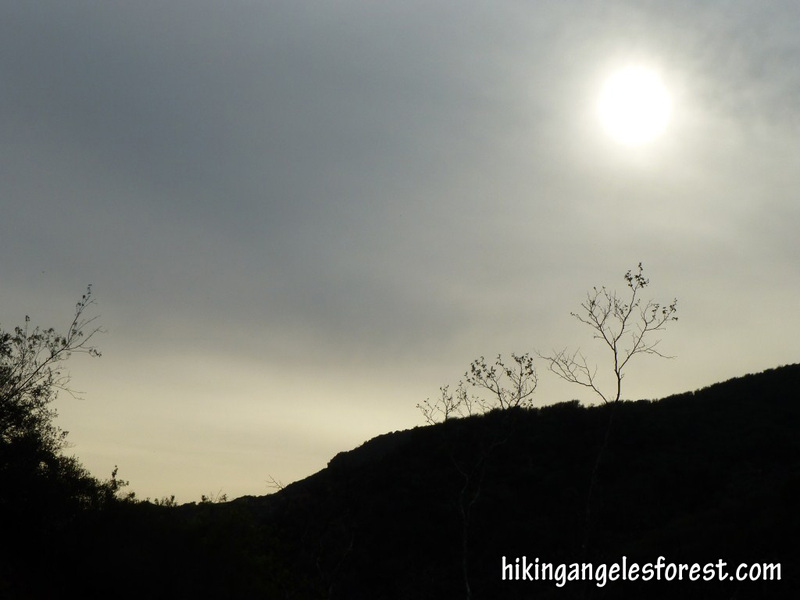 Thanksgiving Day Hike of upper/lower Winter Creek loop from Chantry Flat with Scott and Kelly. Stats: 4.8 miles, 1000′ gain. #073 on 11-17-13. Gabrieleno Trail from Switzer to Bear Canyon Trail just below CG with Monique. Stats 6.1 miles, 1750′ gain. #072 on 10-31-13. Gabrieleno Trail from Red Box to West Fork Campground solo hike. Stats: 10.6 miles, 2070′ gain. Gabrieleno Trail between Valley Forge Campground and JCT Kenyon Devore Trail. #071 on 10-24-13. 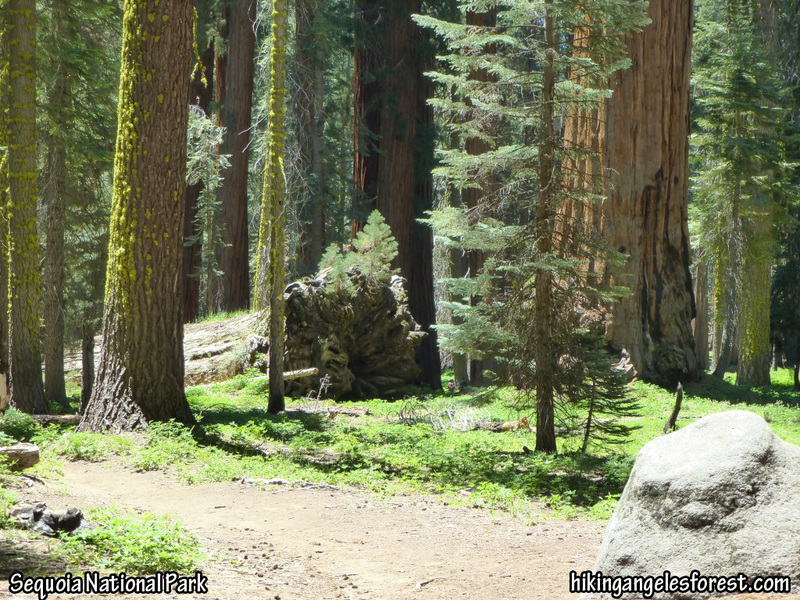 Pacific Crest Trail from Three Points to Sulfur Springs Campground solo hike. Stats: 7 miles, 645′ gain. Pacific Crest Trail near Sulfur Springs Campground. #070 on 9-26-13. Switzer’s Picnic area to Switzer Falls with Bryan. Stats: 3.1 miles, 990′ gain. #069 on 8-1-13. Trail Camp to Mt. Whitney and back down to Whitney Portal. Stats: 15.7 miles, 2811′ gain, 6486′ loss. View east from Mt. Whitney. Notice smoke from the fires near Mammoth in the background. #068 on 7-31-13. Whitney Portal to Trail Camp with Debbie, Camila, and Etienne. Stats: 6.3 miles, 3675′ gain. #067 on 7-28-13. Icehouse Canyon, Three Tees Trail to Telegraph Peak and Thunder Mountain, down to Baldy Notch and snack at restaurant, ski lift down to parking lot, road down to Icehouse Canyon with Debbie. Stats: 12.1 miles, 4717′ gain. Three Tees Trail, view toward Thunder Mountain. 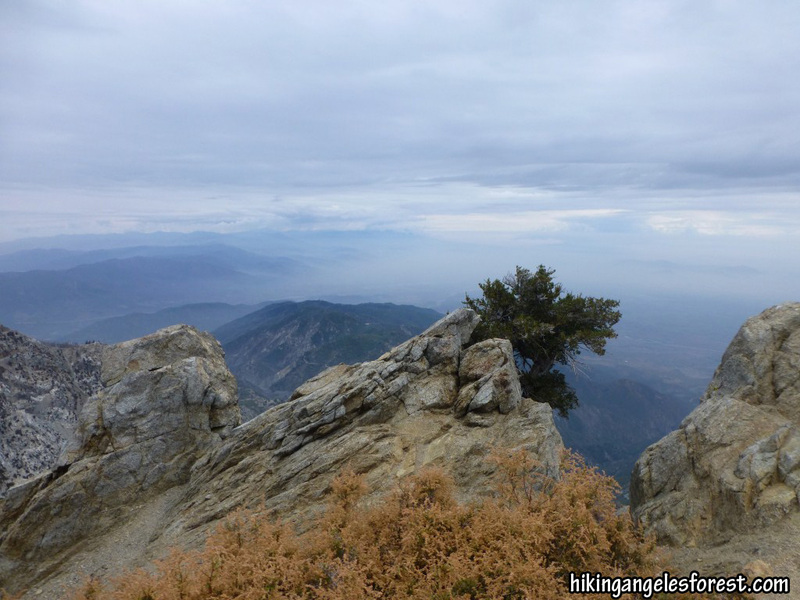 View from Cucamonga Peak toward fires on Mt. San Jacinto. #065 on 7-18-13. Point Lobos State Park: Bird Island Trail, South Shore Trail, and part of Sea Lion Point Trail with Debbie, Kevin, Sarah, Soso. Stats: 3.1 miles, 80′ gain. #064 on 7-16-13. Canyon Trail to Canyon Falls in Julia Pfeiffer Burns State Park with Debbie, Kevin, Sarah, and Soso. Stats: 0.7 miles, 200′ gain. #063 on 7-14-13. Alta Trail from Mehrten Meadow to Alta Peak, down to Panther Gap, Panther Gap Trail/Lakes Trail down to Wolverton with Debbie and Etienne: Stats: 9.6 miles, 2205′ gain. #062 on 7-13-13. Congress Trail from Sherman Tree Parking Lot to JCT Alta Trail and Alta Trail to Mehrten Meadow with Debbie and Etienne. Stats: 5.6 miles, 2245′ gain. More photos here. #061 on 7-13-13. Big Trees Trail and Beetle Rock with Scott and Kevin J. on day 3 of bachelor party. Stats: 2.1 miles, 100′ gain. More photos here. #060 on 7-12-13. Short hike to Hanging Rock and rocks above to watch sun go down with Scott, Sean, and Kevin J on day 2 of Bachelor Party. Stats: 0.2 miles, 200′ gain. More photos here. #059 on 7-12-13. Quick solo hike of Grant Grove and parts of the North Boundary Trail in Kings Canyon National Park on day 2 of Bachelor Party. Stats: 1.5 miles, 225′ gain. More photos here. #058 on 7-12-13. Hiked Muir Grove Trail with Scott and Sean on day 2 of Bachelor Party Trip. Stats: 4 miles, 800′ gain. More photos here. #057 on 7-11-13. Hiked the Buena Vista Trail to Buena Vista Peak with Scott on day 1 of Bachelor Party Trip. Stats: 2 miles, 405′ gain. More photos here. #056 on 7-7-13. Debbie Lorenzo, Etienne, and I hiked from Vincent Gap to Islip Saddle summiting Mt. Baden-Powell, Mt. Burnham, Throop Peak, and Mt. Hawkins along the way. Stats: 12.3 miles, 3750′ gain, 3665′ loss (Islip Saddle 85′ lower in elevation than Vincent Gap). View of Mt. 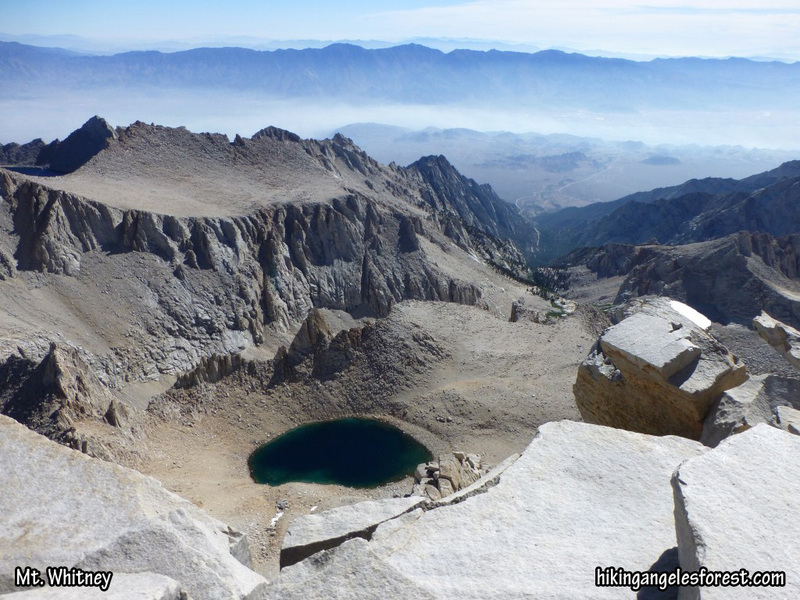 Hawkins from the Pacific Crest Trail. #055 on 6-29-13. 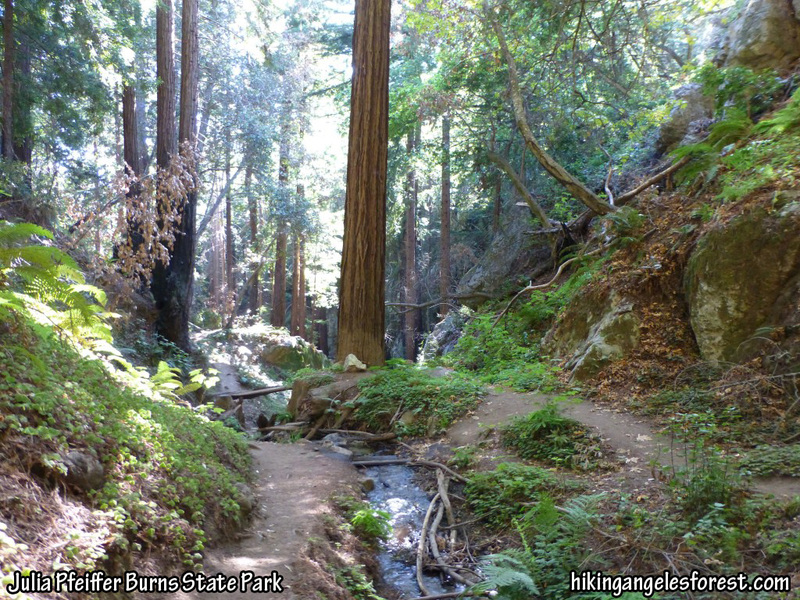 Debbie, Lorenzo, Etienne, and I hiked to Timber Mountain going up Icehouse Canyon and down the Chapman Trail. Stats: 10.7 miles, 3343′ gain. View of Telegraph Peak and Mt. Baldy from Timber Mountain. #054 on 6-27-13. Day two of camping trip at Rock Creek Campground in the Eastern Sierras with Sarah. 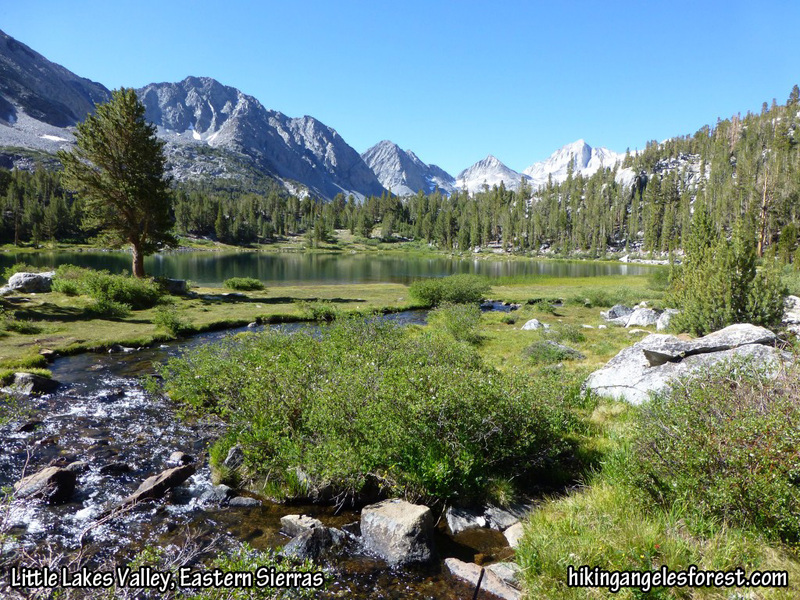 We hiked the Little Lakes Valley Trail from Mosquito Flat to Morgan Pass. Stats: 7 miles, 1,000′ gain. #053 on 6-23-13. Day two of backpacking trip. Mount Marion Trail from Little Round Valley to Trailhead with Debbie and Lorenzo. Stats: 4.3 miles, 3500′ loss. Pacific Crest Trail between JCT Fuller Ridge and JCT lower portion of Mt. Marion Trail. #052 on 6-22-13. Mount Marion Trail to Little Round Valley where we set up our tents. After that we (Debbie, Lorenzo, and myself) summited Mt. San Jacinto and cooked dinner under the moonlight from a “supermoon” and hiked back down to Little Round Valley to spend the night. Stats: 7.5 miles, 4534′ gain, 1034′ loss. Early evening view from Mt. San Jacinto. #051 on 6-15-13. Manker Flats to Mt. Baldy, down Devil’s Backbone, dinner at the restaurant and down access road to Manker Flats with Debbie (her first summit without using the ski lift). Stats: 11 miles, 3904′ gain. #050 on 6-13-13. 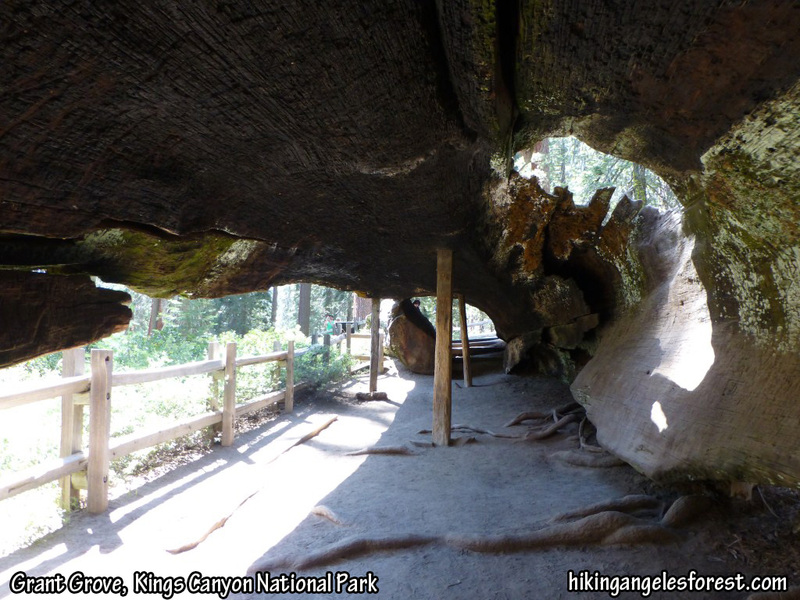 Giant Forest, Sequoia National Park. 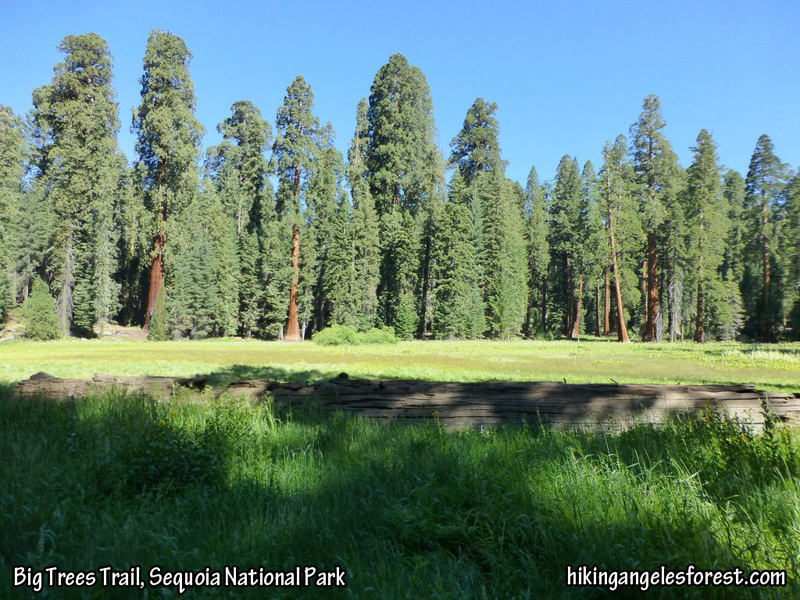 Sarah and I hiked the Congress Trail with some minor extensions to the Lincoln Tree and the giant sequoia growing out of the dead giant sequoia near the junction with the Alta Trail. Stats: 3.1 miles, 450′ gain. South of JCT with Congress Trail and Alta Trail. #049 on 6-2-13. 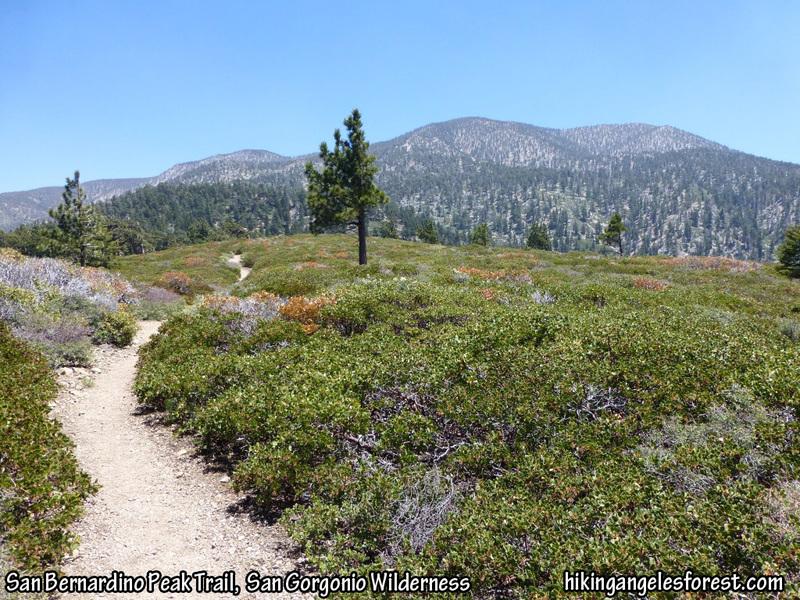 Day two of backpacking trip in the San Gorgonio Wilderness of San Bernardino National Forest. 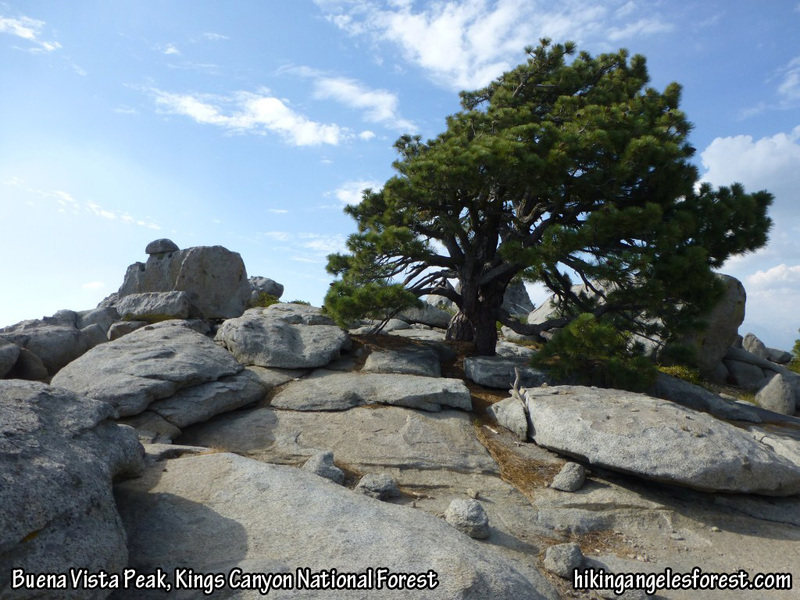 I hiked from Limber Pine Bench to San Bernardino Peak and back down to Angelus Oaks with Debbie, Lorenzo, and Etienne. Stats: 12.1 miles, 1290′ gain and 4690′ loss. View from San Bernardino Peak toward Mt. San Gorgonio. #048 on 6-1-13. 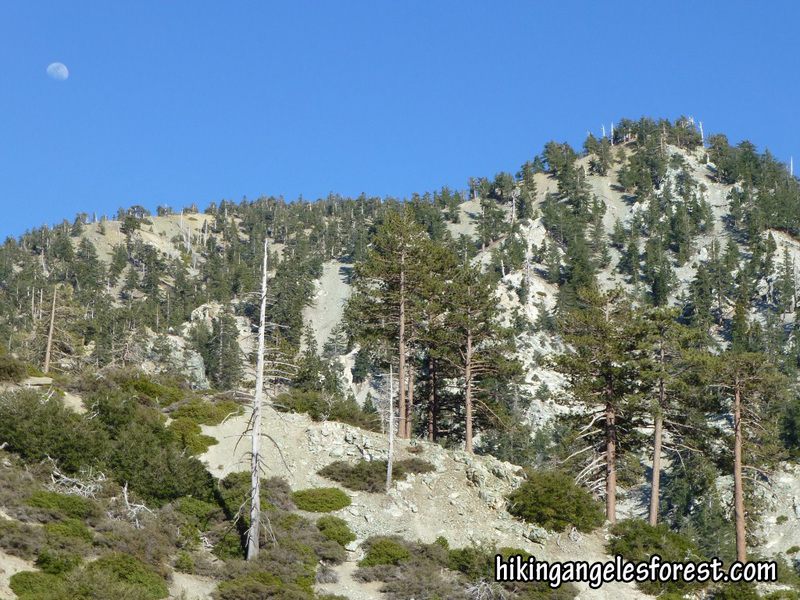 Day one of backpacking trip in the San Gorgonio Wilderness of San Bernardino National Forest. I hiked the San Bernardino Peak Trail from Angelus Oaks to Limber Pine Bench and spent the night with Debbie, Lorenzo, and Etienne. Stats: 5.9 miles, 3400′ gain. San Bernardino Peak Trail between the Wilderness Sign and the JCT with Columbine Springs. #047 on 5-27-13. From Dawson Saddle, I hiked to Mt. Burnham, Mt. Baden-Powell, and Throop Peak with Debbie. Stats: 9 miles, 2680′ gain. Pacific Crest Trail between Mt. Baden-Powell and Mt. Burnham. #046 on 5-26-13. From Buckhorn Campground, I hiked the Burkhart Trail to Burkhart Saddle and then the Will Thrall Peak “use” Trail to Will Thrall Peak with Camila, Etienne, and Lorenzo. Stats: 11 miles, 3340′ gain. #045 on 5-19-13. Day three of three day backpacking trip. 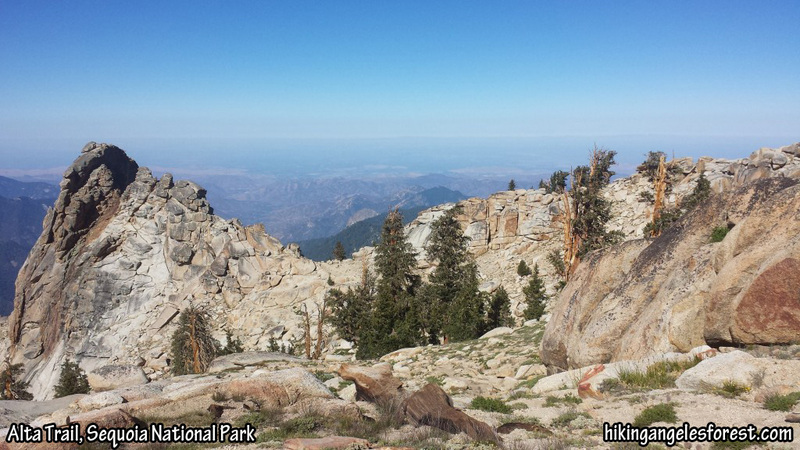 From Kelly Camp; Debbie, Lorenzo, and I hiked up to Ontario Peak and then Bighorn Peak. 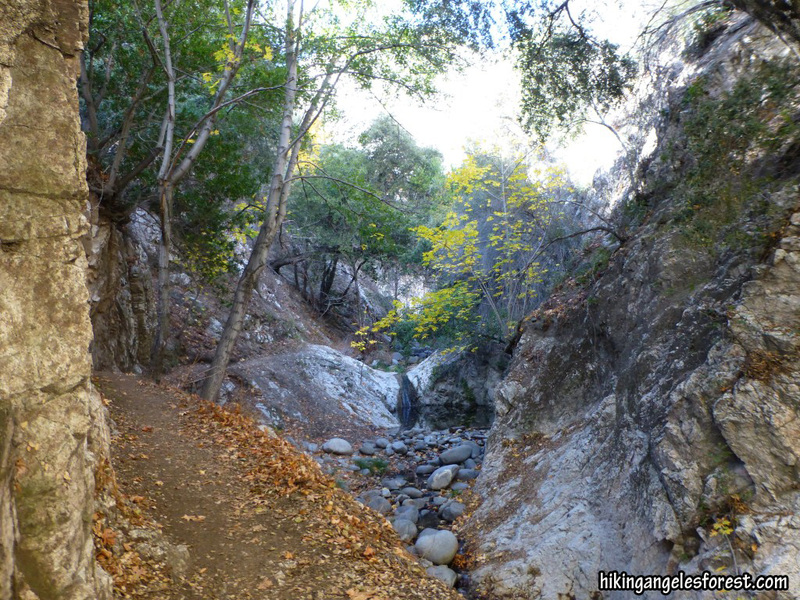 After returning to break camp, we hiked down to the trailhead using Icehouse Canyon. Stats: 9.3 miles, 1355’gain. Ontario Peak Trail between Kelly Camp and the saddle with Bighorn Peak. #044 on 5-18-13: Day two of three day backpacking trip. 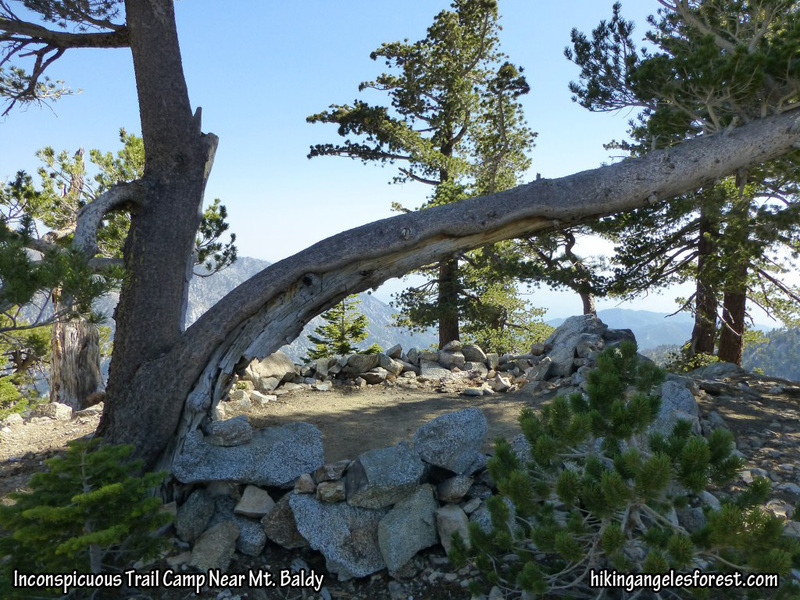 From Kelly Camp; Etienne and I hiked down to Icehouse Saddle and then up to Cucamonga Peak. We then went down the Icehouse Canyon Trail. At the Lower JCT with the Chapman Trail, Etienne continued to the trailhead and I waited for Debbie and Lorenzo. We then hiked up to Columbine Spring to refill our water and finished up at Kelly Camp. Stats: 11.8 miles, 3840′ gain. #043 on 5-17-13: Day one of three day backpacking trip. 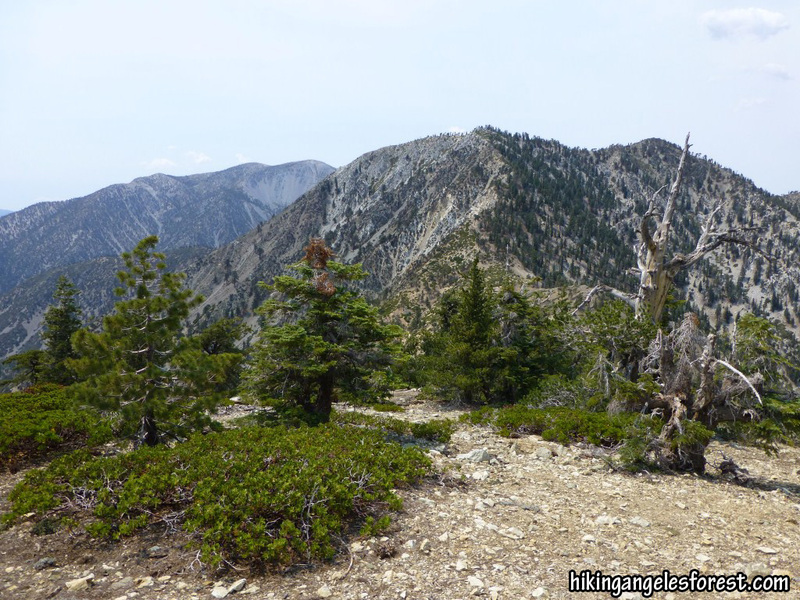 I hiked up the Icehouse Canyon Trail and Ontario Peak Trail to Kelly Camp with Etienne. Stats: 4.3 miles, 2880′ gain. #040 on 5-11-13. Hike up Icehouse Canyon to Kelly Camp and down Chapman Trail with Debbie and Lorenzo. Stats: 10.7 miles, 2880′ gain. Ontario Peak Trail between Icehouse Saddle and Kelly Camp (click to enlarge). #039 on 5-3-13 Camp at Horse Flats with Debbie and Lorenzo. On 5-4-13 shuttle hike from Three points to Mt. Waterman and down to Mt. Waterman Trailhead by Buckhorn with Debbie, Lorenzo, Karl, and Valery. Stats: 10 miles, 2155′ gain. Mt. Waterman Trail between Three Points and JCT Twin Peaks Trail. #038 on 4-28-13. 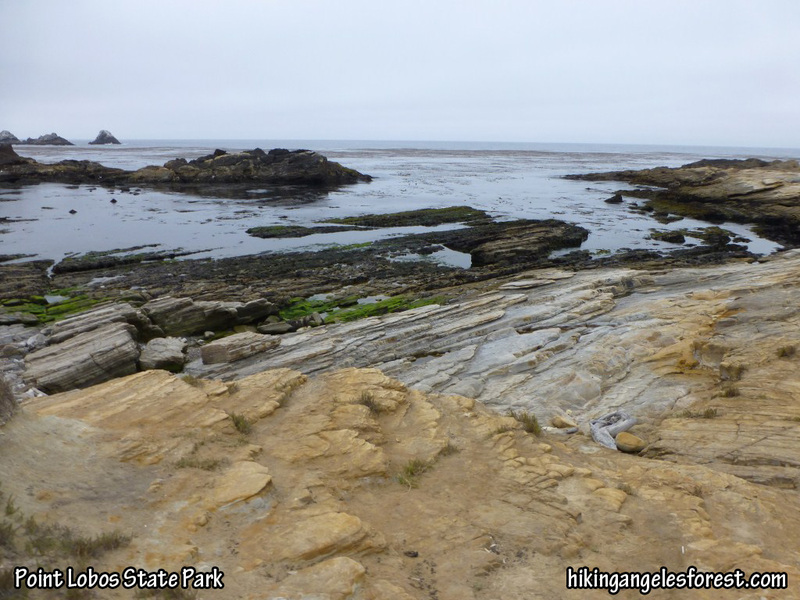 Hike to Inconspicuous Trail Camp from Manker Flats with Debbie, Lorenzo, and Derrick. Stats: 6 miles, 2640′ gain. Described in this post. Inconspicuous Trail Camp Near Mt. Baldy. #036 on 4-21-13. Icehouse Canyon to Icehouse Saddle, back Chapman Trail with Lorenzo. Stats: 8.9 miles, 2620′ gain. #035 on 4-14-13. Above the clouds on the Pacific Crest Trail from Islip Saddle to Mt. Hawkins with Debbie, Lorenzo, Camila, Lucy, Tom. Stats: 8.9 miles, 2490′ gain. #034 on 4-4-13. North Kaibab trail from Cottonwood Campground to Bright Angel Campground. 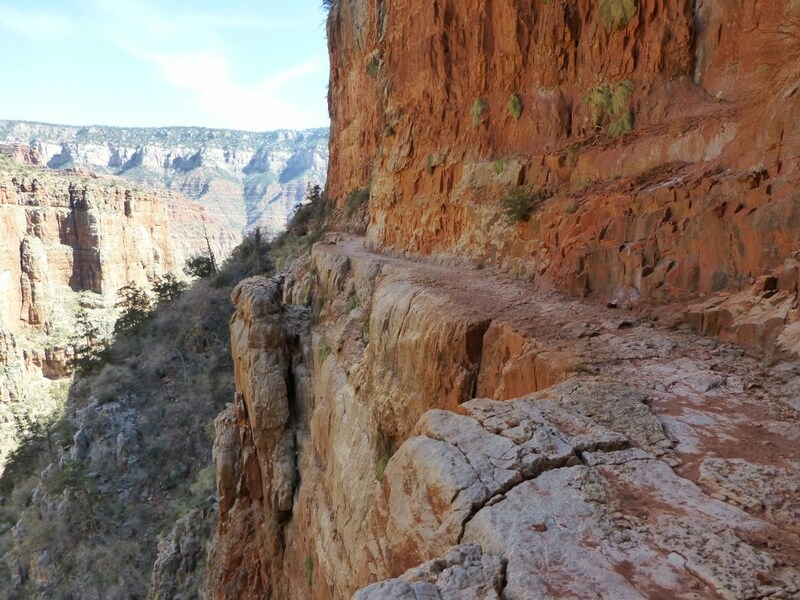 Then Bright Angel Trail to South Rim with Scott. Stats: 16.7 miles, 4380′ gain. #033 on 4-3-13. 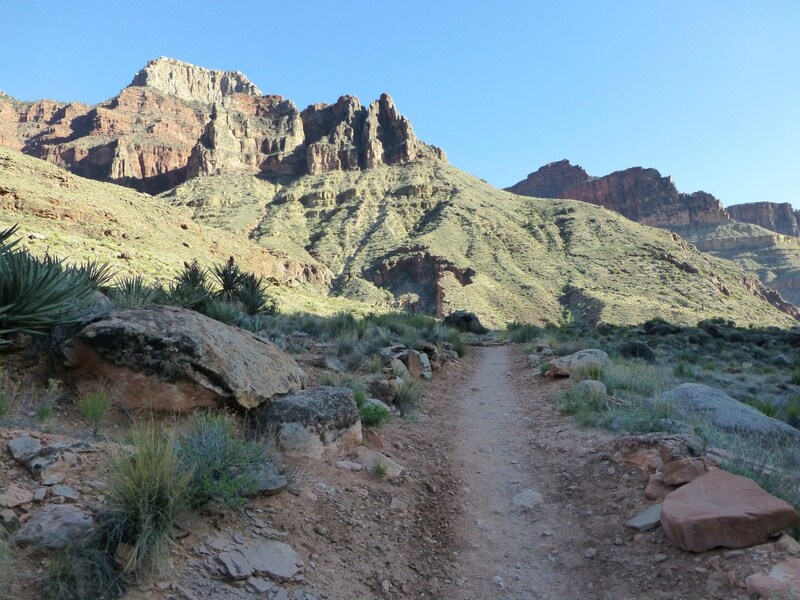 North Kaibab Trail from Cottonwood Campground to North Rim and back with Scott. Short afternoon hike down to where stream crosses North Kaibab trail to get water. Stats: 14.6 miles, 4280′ gain. 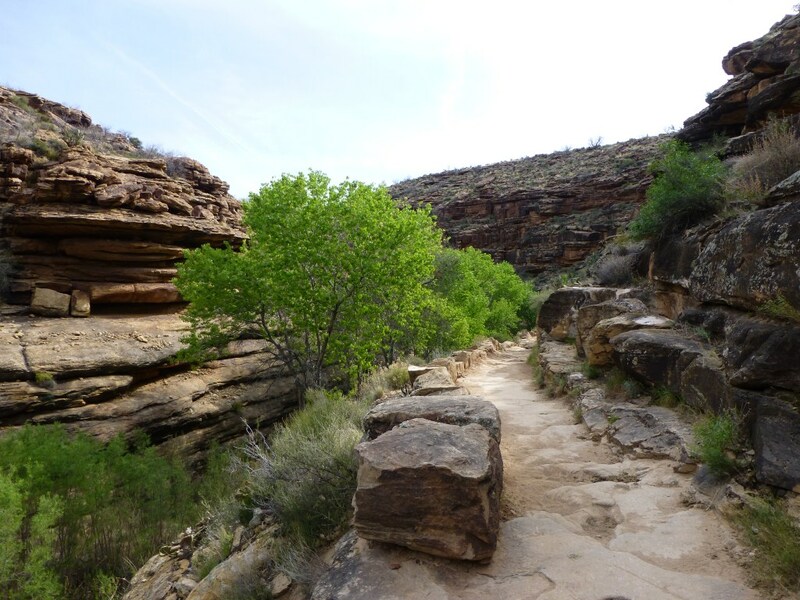 North Kaibab Trail between Cottonwood Campground and the North Rim. #032 on 4-2-13. North Kaibab Trail from Bright Angel Campground to Cottonwood Campground. Then an afternoon hike after setting up camp back down to Ribbon Falls with Scott. Stats: 10.4 miles, 2060′ gain. #031 on 4-1-13. South Kaibab Trail and some exploration around the Colorado River near Bright Angel Campground in the Grand Canyon with Scott. Stats: 8 miles, no gain. #030 on 3-27-13 Solo hike from Chantry Flat taking the Gabrieleno Trail (upper falls) and Sturtevant Trail to Mt. Wilson and coming down the Upper Mt. Wilson Trail, Mt. Wilson Toll Road, and Upper Winter Creek Trail. Stats: 13.9 miles, 4110′ gain. 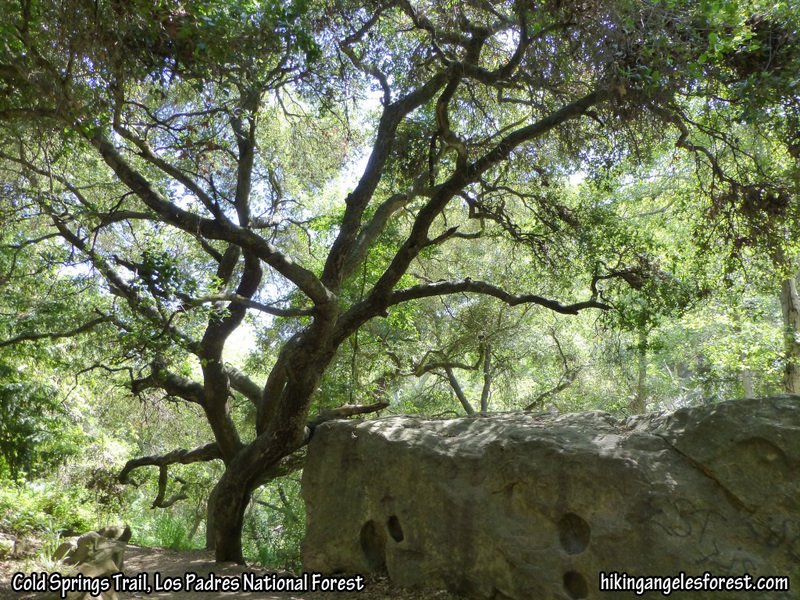 Gabrieleno Trail above Sturtevant Falls. (click to enlarge). #029 on 3-24-13 From Red Rock Trailhead to Gibraltar Dam with Debbie, Etienne, Lorenzo, and Roxanne. Stats: 7 miles, 640′ gain. More photos of the Santa Ynez River Valley here. 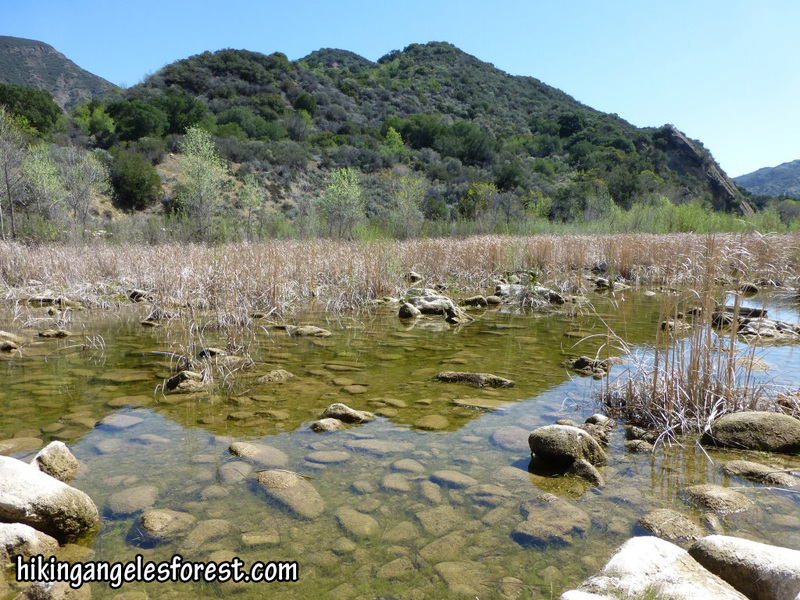 #028 on 3-23-13 From Upper Oso Campground to Nineteen Oaks Campground with Lorenzo. Stats: 3.6 miles, 430′ gain. More photos of Upper Oso Canyon here. #027 on 3-23-13 From Red Rock Trailhead to first water pool past Red Rock. Short family/friends hike on Camping Trip at Upper Oso Campground, Los Padres National Forest with Debbie, Lorenzo, Etienne, Camila, Chloe, Olivia, and Lupita. Stats: 1.4 miles, 245′ gain. More photos of the Santa Ynez River Valley here. Red Rock, Los Padres National Forest. #026 on 3-19-13. 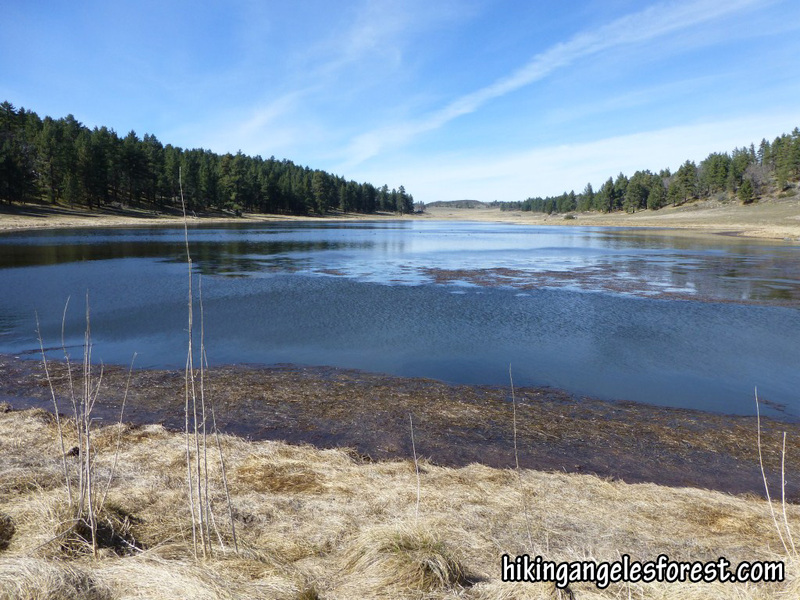 Great introductory hike of the Laguna Mountains traversing portions of several trails and ecotones with Scott. Starting from the trailhead near mile marker 19 on Sunrise Highway, the loop traverses Old Country Road (paved), Agua Dulce Creek Road (not paved), The Big Laguna Trail from the JCT with Agua Dulce Creek Road to the JCT with the Pacific Crest Trail crossing Sunrise Highway, a “use trail” from the PCT to Monument Peak and back, the PCT to the Noble Canyon Trail crossing Sunrise Highway, The Big Laguna Trail through Big Laguna Meadow, Big Laguna Lake, and Water-of-the-Woods, and back to the trailhead. Stats: About 15.1 miles and 1750′ gain. More photos here. #025 solo hike on 3-17-13. 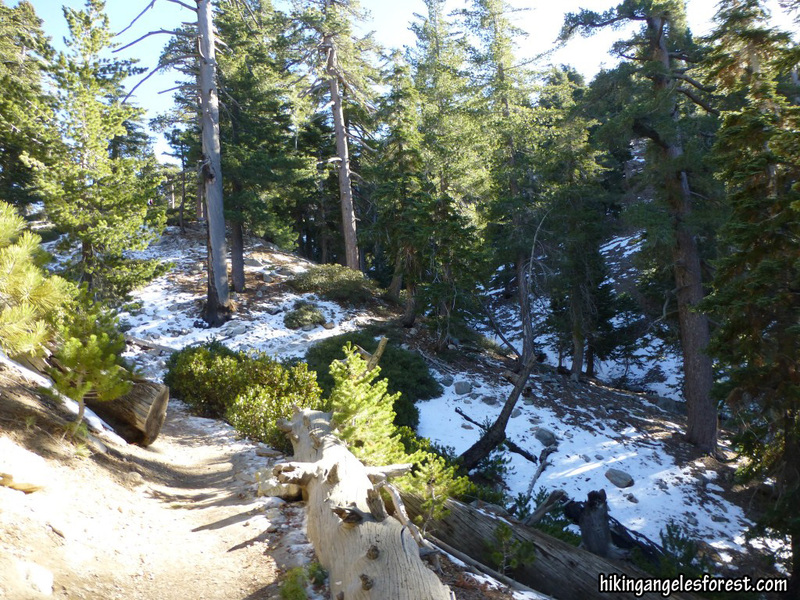 The Pacific Crest Trail and Islip Ridge Trail from Islip Saddle to Little Jimmy with snow. Stats: 6.6 miles, 1890′ gain. Pacific Ridge Trail between Islip Saddle and Little Jimmy Campground. (click to enlarge). #024 on 3-16-13. The Pacific Crest Trail from Three Points to Sulfur Springs Campground with Debbie, Lorenzo, Valery, Karl, and Derrick. Stats: 7 miles, 645′ gain. #023 on 3-12-13. Cobb Estate to Echo Mountain, Castle Canyon to Inspiration Point, OM&M to Muir Peak, East Mt. Lowe to Mt. Lowe, Upper Sam Merrill to Mt. Lowe Campground, Middle Sam Merrill to Echo Mountain and down to Cobb Estate with Scott. Stats: 14.8 miles, 4120′ gain. #022 on 3-10-12. Mt. Wilson Trail up to Orchard Camp with Debbie and Lorenzo. Still getting over a cold, Debbie turned back at first water. Stats: 7.0 miles, 1990′ gain. #021 on 3-5-12. Aqua Tibia Loop Trail in the Cleveland National Forest with Scott. Described in Chapter 16, Trip 2 of “Afoot & Afield San Diego County” by Jerry Schad. Stats: 20 miles, 4100′ gain. 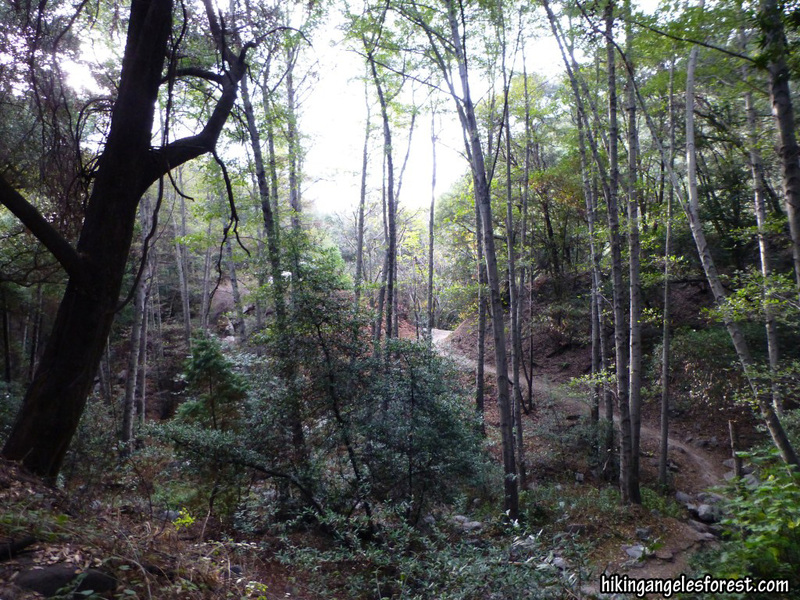 Photos of the Aqua Tibia Loop Trail. Upper Bear Canyon between Tom Sloan Saddle and Bear Canyon Campground. #018 on 2-25-13. Cobb Estate to Echo Mountain with Etienne, Camila, Chloe, and Olivia. 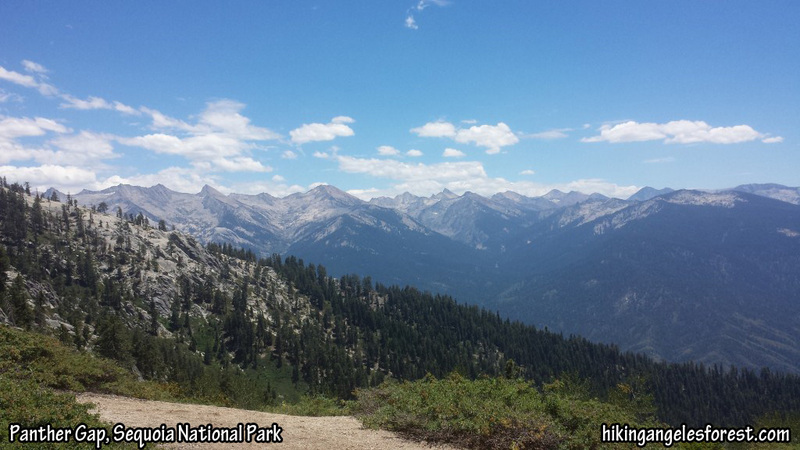 Then solo hiked Castle Canyon, Inspiration Point, Muir Peak, Inspiration Point, East Mt. Lowe Trail to Mt. Lowe, Upper Sam Merrill, Middle Sam Merrill, and Lower Sam Merrill back to Cobb Estate. Stats: 14.8 miles, 4070′ gain. #016 on 2-17-13. Switzer Picnic Area to Bear Canyon Campground and Switzer Falls with Debbie and Lorenzo. Stats: 7.5 miles, 1860′ gain. #015 on 2-15-13. Cobb Estate, Castle Canyon, Inspiration Point, Tom Sloane Saddle, Inspiration Point, Sam Merrill solo hike. Stats: 16 miles, 3969′ gain. #014 on 2-13-13. Switzer Picnic Area to Bear Canyon Campground solo hike. Stats: 7.2 miles, 1810′ gain. #013 on 2-10-13. Gabrieleno Trail from Red Box to Valley Forge in snow with Debbie, Lorenzo, Lucy, Tom, Etienne, Camila, Aitana, Chloe, Olivia, and Lupita. Stats: 4.6 miles, 1160′ gain. #012 on 2-9-13. Gabrieleno Trail from Red Box to Valley Forge solo hike in snow. Stats: 4.6 miles, 1160′ gain. #011 on 2-4-13. 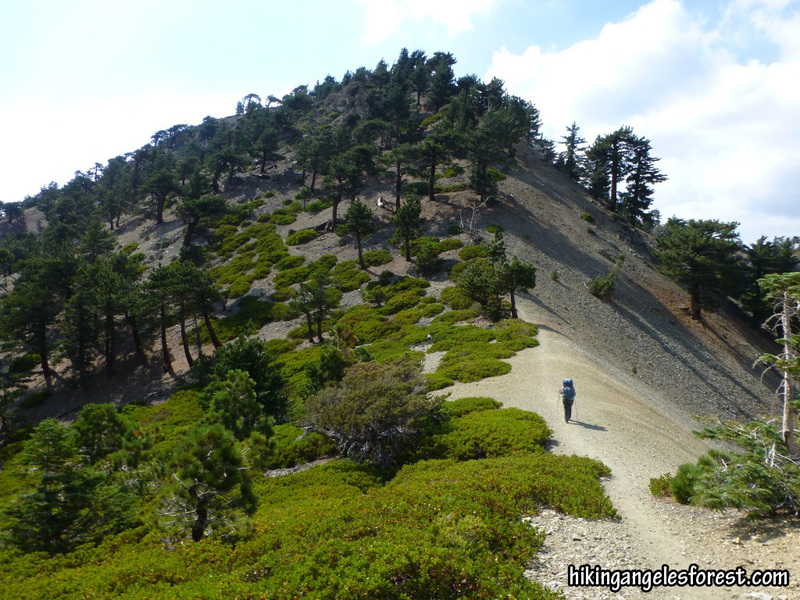 San Gabriel Peak Trail, Mt. Deception (explored a little further), Mt. Disappointment solo hike. Stats: 4.7 miles, 1797′ gain. #010 on 2-3-13. Gabrieleno Trail from Red Box to Valley Forge with Debbie, Lorenzo, Tom, and Lucy. Stats: 4.6 miles, 1160′ gain. #009 on 2-1-13. Mt. Wilson Trail to Mt. Wilson solo hike. Stats: 14 miles, 4750′ gain. #008 on 1-26-13. Gabrieleno Trail from JPL to Dam past Paul Little Campground with Debbie, Troy, Ziggy, Digby, Lena, Lucy, Tom, and Susan. Stats: 8.5 miles, 806′ gain. #007 on 1-23-13. Cobb Estate, Castle Canyon, Inspiration Point, Sam Merrill solo hike. Stats: 10.2 miles, 2709′ gain. #006 on 1-21-13 Eaton Saddle, East Mt. Lowe, Mt. Lowe Campground and back with Sarah, Troy, Marie, Jake, Ziggy, and Digby. Stats: 5.8 miles, 1204′ gain. #005 on 1-20-13. La Crescenta Trail to rock below road (small loop near top) with Etienne and Camila. Stats: 5.4 miles, 2200′ gain. #004 on 1-19-13. Switzer Picnic area to just below Bear Canyon Campground with Debbie and Sarah. Stats: 6.1 miles, 1750′ gain. #003 on 1-13-13. Snowshoeing in Giant Forest, Sequoia National Park with Scott. Stats: 7.7 miles, 1000′ gain and loss (estimate). Related Post: Nature’s Version Of New York City. 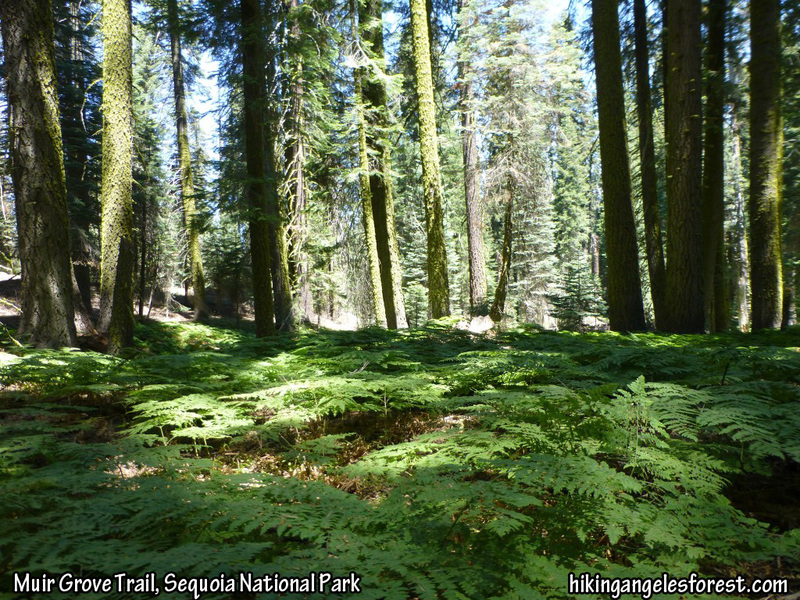 Crescent Trail, Giant Forest in Sequoia National Park (click to enlarge). #002 on 1-12-13. 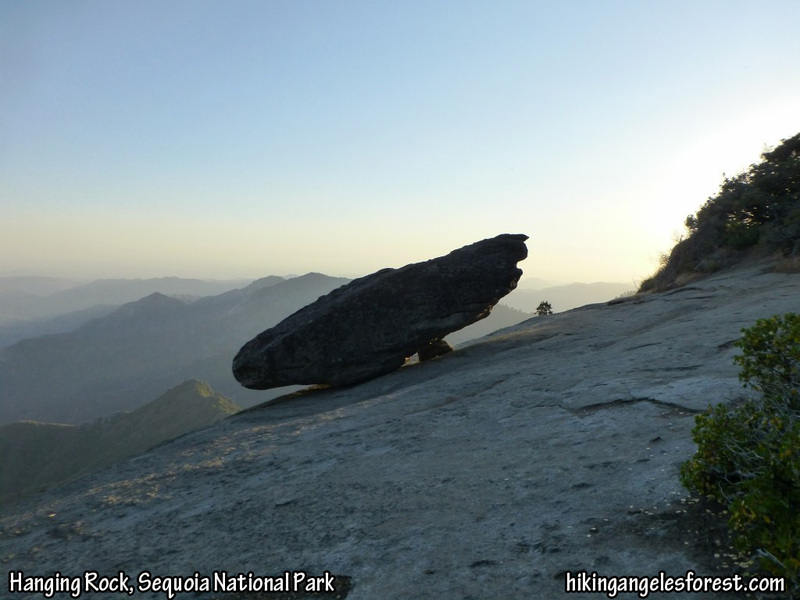 Partial hike of Marble Falls Trail in Sequoia National Park with Scott. Stats: 5 miles, 1500′ gain and loss (estimate). Related Post: Nature’s Version Of New York City. Brown Bear, Marble Falls Trail, Sequoia National Park. #001 on 1-6-13. Solo hike of the Rim of the Valley Trail to Mt. Lukens. Stats: 10.4 miles, 2905′ gain and loss (GPS data). Rim of the Valley Trail (click to enlarge). Like you, I was above the clouds yesterday (4/14/13). Hiked the Ice House Canyon, 3T, Baldy trip you described. The info you porvided was very helpful — thank you. 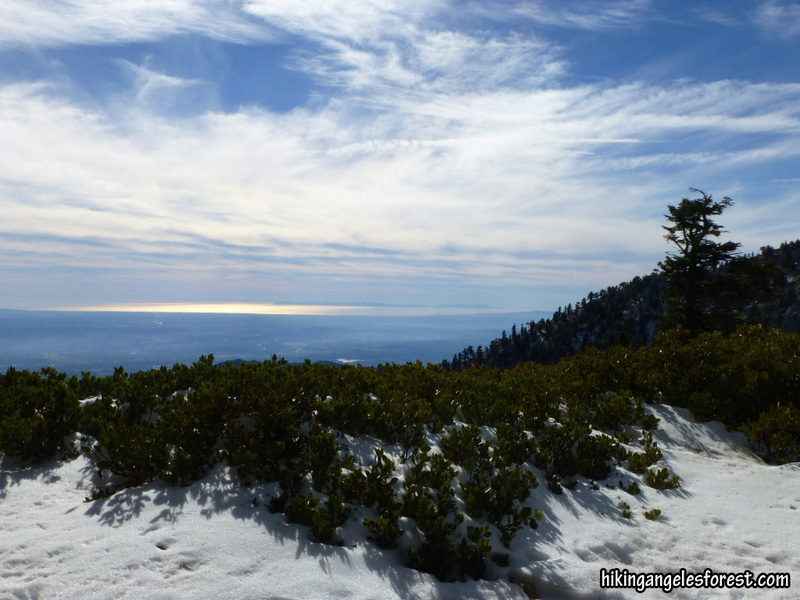 The view was unbelievable — with San Gorgonio and San Jacinto floating about the sea of clouds. Thanks, and that’s a great hike. I had a good view of Baldy from Mt. Hawkins but the view from Baldy must have been fantastic.